Today I wanna share with you my new fave way to protect my skin: Supergood Body Oil Sunscreen. This is definitely a product that kills two birds with one stone, making it a beauty purchase you didn't know you needed! With Spring in full force and Summer right around the corner, I am wayyyy more cautious when it comes to being in the sun. Our skin is much less forgiving as we age and even though I know I am not old by any means, I still want to be as cautious for the future health and appearance of the skin on my face AND BODY. I definitely do a better job of keeping my face protected with a high SPF than I do with my body. I know that skin is skin, but because your face is given so much more attention (because it's your face! ), it can be easy to neglect the other parts of your body from the suns harmful rays. I am also not a person that puts on lotion daily, so my body tends to feel and look dry. Couple that with sun damage and you got some dry aging skin with little elasticity. That's where Supergoops Body Oil with SPF 50(!!!) comes in. I just discovered this stuff and am loving it sooo much because it solves both the issues I have been having as I prepare for summer trips and getting in my swim suit! I want smooth supple skin that looks nourished and feels soft, while at the same time knowing it is protected from the sun. The thing is, a regular sunscreen can't do what this stuff does because sunscreen isn't meant to be a moisturizer, but this oil is! I also hate how sticky and thick suncreen feels on, which is why this body oil is sooo perfect for me (and every other person on the planet that wants smooth skin protected from the sun). I use it daily and LOVE it you guys. It's a total must for me and my daily regiment. I have gone through my first bottle and have already refilled it. You know I am serious about my sun care so trust me when I say this stuff is not only effective but looks beautiful and dewy on. If you guys have products for anti-aging and sun care, let me know! I am always looking out for great sunscreen and anti-aging products. I have a busy day today so I am off to West Hollywood for some errands, meetings, and then to a birthday party for my brother and sister! Hope you guys have a fun day planned! See you back here tomorrow! Today were talking THE BEST foundation with SPF. Okay so let me jump right into it since this is as straightforward as it gets. I knew about the company Avene for the last few years as I had seen in it French Pharmacies as well as The Beauty Collection Stores when I would shop locally. People always had great things to say about the line, but if I'm being honest, I think I was drawn to more aggressive skin care brands like Dr. Dennis Gross, because I felt like I needed lots of PEELING! ACID! REJUVENATION! Do you know what I mean? Of course, I will always love DDG, but there is room for other brands. However, I'm picky and when I hear the word "gentle" I assumed that meant it wasn't effective. I had tried out one product from Avene years ago (Thermal water) and loved the way it felt, but wasn't in the position at the time to be able to refill items continuously (even though it is very affordable!). I didnt have the luxury at the time to pay as much attention to my skin plus I was younger so it wasn't asss pressing. Welp, recently I was at an event for The Beauty Collection Stores 20th Anniversary and since I am an ambassador for the company, I got a one on one with an employee from Avene who gave me a mini facial. It was amazing, the products felt so refreshing and hydrating on my skin. I also had this huge gaping hole in my forehead due to me accidentally cutting myself, and it got infected and looked like a huge zit. The facialist cleansed my face, hydrated it, and after I was all good she realized I wouldn't wanna walk around with no makeup at the event due to my now huge blemish since she took off my makeup to do the facial. I asked her if she suggested a good foundation that wouldn't totally defeat the whole purpose of the facial and she informed me that Avene had one with SPF 50 that was super popular (how had I never heard of it?!). Seriously you guys, I am so picky about the foundation and cover up I use and this is hands down my new favorite for a few reasons. -Spf 50. I like to know I'm covered when I step outside and not feel greasy, white and streaky, or chalky from other sunscreens I have tried. -Smooth application. It goes on so evenly and looks gorgeous on. I kept getting compliments on how dewy and pretty my skin looked. Trust me you guys, this day without makeup on, it did not look pretty. The zit was so inflamed and red, but this compact completely covered it up. -Melts into your face. The foundation somehow warms to your face and adjusts flawlessly. Its kind of a cream to powder except it doesn't get super powdery or dry looking. Just dewy and smooth. -Coverage. The amount of coverage is amazing to me because it covers scars and zits like no other foundation I have tried. I love Glossier, Bobbi Brown, RMS, and Georgio Armani foundation as well, but these don't have all of what the Avene has. The Spf really tips it over the edge for me. It's so so good you guys. I linked it below with some of my other faves if you're interested! I highly recommend it and would love to know what youre fave concealer/foundation is too! Comment below with thoughts or faves, I am always looking for great products! I love a good natural beauty line. The idea of using a natural beauty product that is made up of minerals and natural and nourishing oils is so much more appealing to me than chemicals and products I can't pronounce. Although I haven't completely switched over to only natural, ( I'm not quite there yet) I still try to incorporate as many of the natural products as I can to slowly replace those that aren't. It's hard because certain makeup lines that aren't natural, do have some very effective products even though I know the ingredients aren't nearly as good for my skin. I like incoporating these quality products and lines into my regiment and hopefully over time I will have enough faves to stop using unnatural and non organic products completely. Who knows! Check out what I am loving and buy again and again! RMS: I know many of you know and love RMS. It is a makeup artist favorite and an amazing line, even when comparing natural lines or not. The pigmented lip to cheek pots are gorgeous and go on flawlessly and are coconut oil based, which is obviously very moisturizing and better for your skin than synthetic ingredients. Products I love from RMS: I am in love with the Lip to Cheek pot in "Promise". It is gorgeous on lips or as a cream blush or both! I am also really into their "magic luminizer" and "un-coverup" concealer. I love using the highlighter on my cheekbones, nose, and temples. A dab will do ya! Glossier: Glossier is on fire right now and for good reason. Their products are hypoallergenic, dermatologist-tested, ophthalmologist tested, non-comedogenic, paraben free, fragrance free, and cruelty-free along with having amazing branding and being easy to use. Products I love from Glossier: I love their Stretch Concealer , Boy Brow for easy and full brows, and their Generation G lipstick. They all go on flawlessly and give a dewy skin look that totally embodies the "makeup no makeup" look. 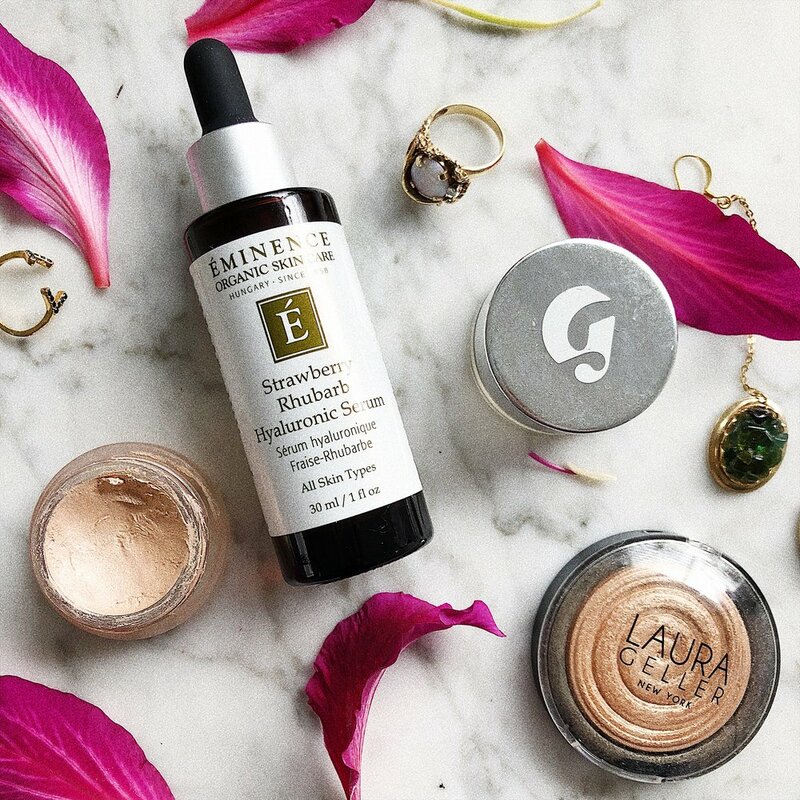 Eminence: I normally lean towards skincare lines that have natural components mixed with a little science so that I know I will see results rather than just nourish my skin with good quality ingredients. I don't want to spend a lot of money on something that merely feels good. The reason I love this brand is because it truly moisturizes deep into the skin. I notice a difference in my skins texture the next day after using it. It smells amazing and has such a great consistency. I also love knowing it won't irritate my skin because it's made of organic and natural ingredients. Products I love from Eminence: I love the consistency, fragrance, and feel of their moisturizers. I especially love the Coconut Age Corrective Moisturizer, Firm Skin Acai Moisturizer, and just started using a very popular product in their line called Strawberry Rhubarb Hyaluronic Serum. It feels great and is known to exfoliate, hydrate, repair and brighten skin to leave it looking soft and rejuvenated. If you haven't tried this line, I encourage you to! It's not too expensive and truly is a quality product. 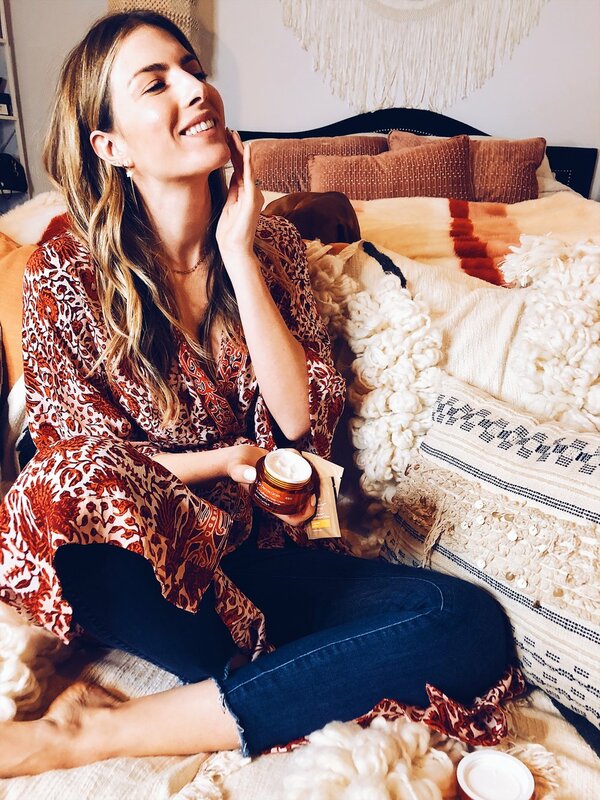 Laura Geller: I was just introduced to Laura Geller through my ambassadorship with the beauty retailer "The Beauty Collection" with stores throughout LA. I get sent products to try and review if I like them, and I have been loving her gilded highlighter and use it all the time! I just feel good knowing I am using a natural product that won't clog my pores and make me breakout. I'm not familiar with other products in the line but would love to try some more of them out! Products I love from Laura Geller: I love the Baked Gelato Swirl Illuminator in Gilded Honey and cannot wait to try more products!! Bare Minerals: I LOVE Bare Minerals and have always been a fan. I have been using their products for years now and love how good my skin looks and feels when I use it. Products I love from Bare Minerals: I am obsessed with their Complexion Rescue Tinted Hydrating Gel Cream . It goes on flawlessly and people always give compliments when I wear it. I LOVE LOVE LOVE IT! Have you guys tried any of there products and do you love? I hope this helps introduce you to some solid products from great quality natural lines that are effective, good to the planet, and good for your skin. Love you guys and see you back here in a couple days!! Okay so this is a really deep post you guys so pay attention. Im sharing my GO-TO nail colors that are my favorites, the best of the best! If you are like me, you're extremely picky about your nail colors. I don't pay for a gel manicure every 4-6 weeks (even though they recommend every 2, I cannot pay for new color thaaaat much. Priorities people.) to get a boring or unflattering color that I will be stuck with for another month. I have tried lots of colors over the years and always come back to my favorites in different categories. If I want a fun color, I have a fave for that. If I want a pretty neutral but never a boring one, I have my faves. And when I am in the mood for some darker moodier colors, I have my top faves in those categories. I have posted a bunch on Insta stories and I get DM's asking "what was that color again?". You guys, I have gotten so many people asking in person or on insta what the name of my nail color was or just over the years with tons of compliments on certain ones. I compiled a list of the most popular ones below. These will be your future go-tos, promise! See below for my favorites! As you can see I am a huge fan of OPI nail colors. I love to look at other companies too but the colors from OPI just stand out a bit more to me. There are so many varying shades out there, but these specific colors are so great on! Just try your fave picks from above the next time you get your nails done (but get them done in the gel version! ), you'll thank me:). Which color is your favorite? I am pretty obessed with "Funny Bunny" and "I am What I Amethyst" currently! Welp, My orange wine and sweet potato fries are waiting for me so I gotta go, but I'll see you in a couple days! Ahhhh glycolic acid. One of my favorite things to treat my skin with. If you guys have been following along, you'll know I have discussed glycolic pads (here) and how effective they are for all skin types. 3. Helps rid the skin of hyperpigmentation spots from acne or sun. Wellll, I loved this stuff so much, I went a little wild on it and learned a few lessons. Hopefully, my mistakes will help you to avoid some painful and embarrassing looking mistakes. 1. Don't apply glycolic masks for any longer than the specified time! That may seem obvious but it's not. You may think you need a little extra treatment, as did I ONCE. Soooo you leave it on for 45 minutes to realllllly treat your skin rather than the 10 minutes it suggests... Don't do that. Read the instructions and stick to them. 3.Rinse off fully with lukewarm water and rehydrate the skin with a very moisturizing serum or cream. I suggest doing this at night so you don't have to bother with the sun and SPF blah blah because that's one added step. ( I don't like unnecessary steps.) I love to use a super moisturizing cream like Eminence Coconut Age Corrective Moisturizer or their Firm Skin Acai Moisturizer. Both of these creams are super moisturizing, organic, and calming to my skin with natural age defying products in them. Seriously in love with them. If you use glycolic masks, which I SERIOUSLY advise from all of the research I've done, just make sure you follow instructions and don't try to combine too many products before or after. I am a skincare junkie these days and sometimes get a little too excited and ambitious when it comes to application. More is not always better when it comes to your skin. I hope you guys can learn from my mistakes and get the benefits of Glycolic without the aftermath I faced from using too many amazing but non cohesive products and devices together.